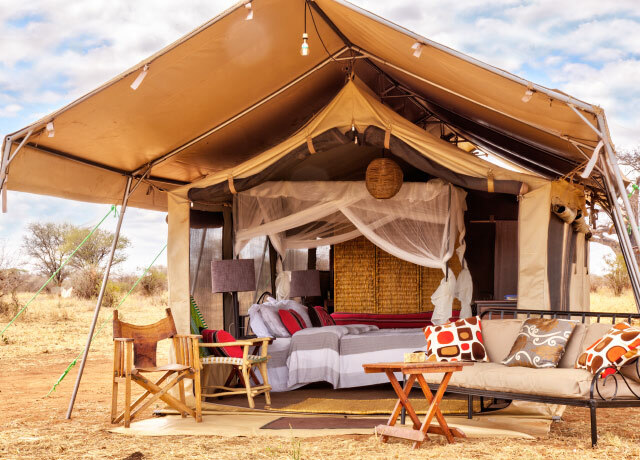 This deluxe mobile camp in the heart of the national park is set seasonally to sync with the movement of the massive elephant herds the park is famed for, as they arrive in search of permanent water. 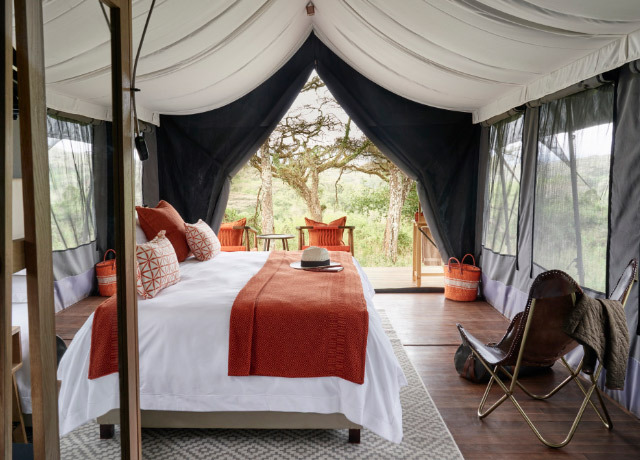 This luxury camp within a private reserve is optimally located on the crater rim near a less-traveled access road that provides a quick entry into the crater, beating crowds to maximize time viewing wildlife. 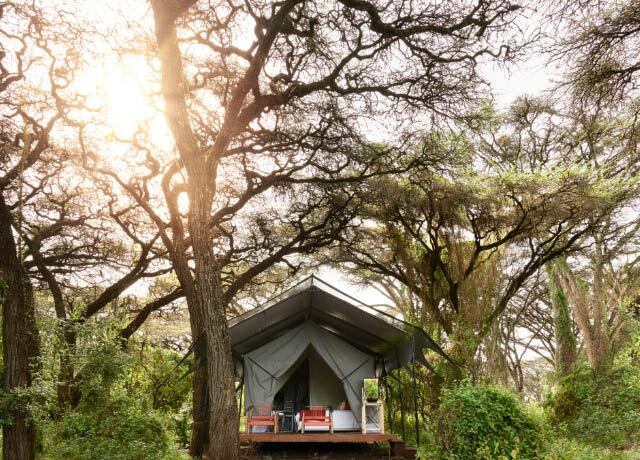 Secluded in an acacia forest on the edge of the crater rim, this optimally located camp offers exceptional proximity to the crater floor, and spacious, comfortable canvas tents to return to at night. 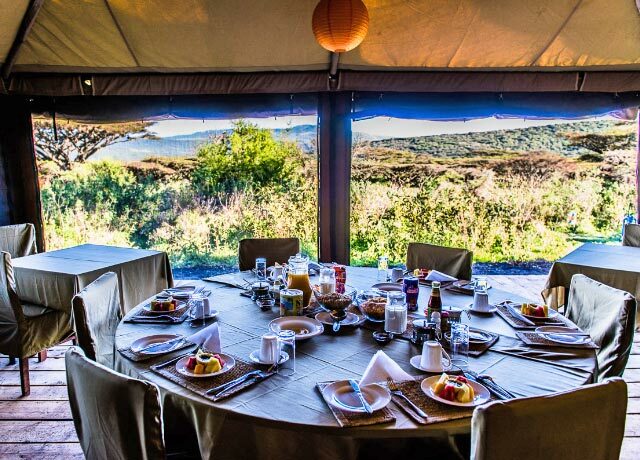 This classic canvas-tented camp enjoys an optimal location on the crater rim in close proximity to the crater access road, allowing guests to be first on the scene each morning for a quieter safari experience. 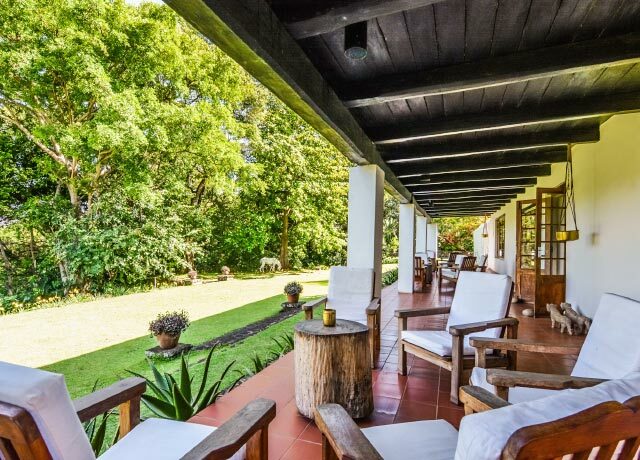 This intimate, owner-run lodge is set among lavish gardens filled with tropical plants, flowers and exotic birds, offering gracious hospitality in an oasis-like setting surrounded by coffee plantations. 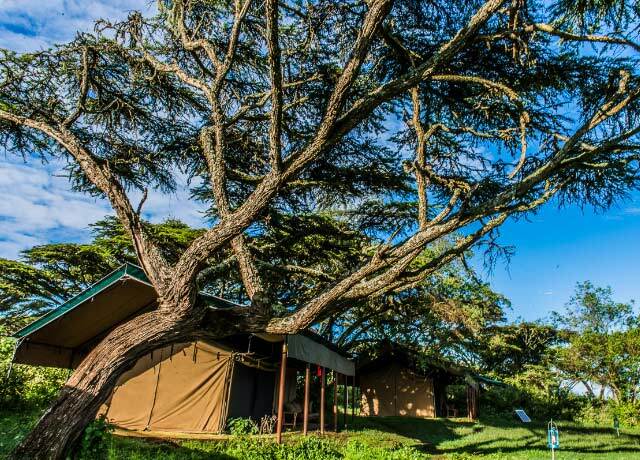 Tarangire Ndovu Camp is located in the heart of Tarangire National Park, famed for its massive elephant herds, giant baobab trees and true sense of wilderness. 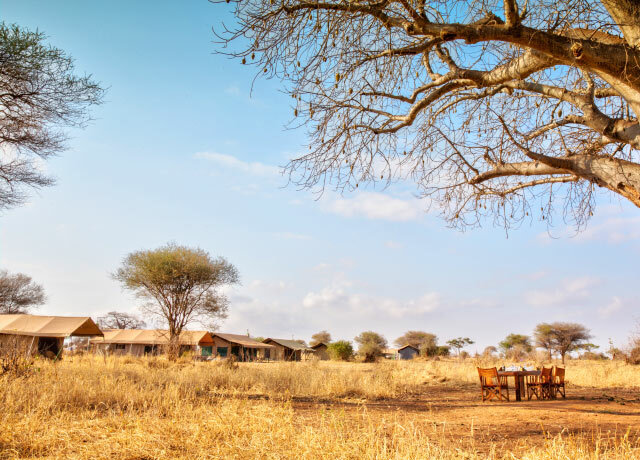 Ndovu Camp is a mobile operation, set seasonally to sync with the movement of elephants through the corridor between Manyara and Tarangire during the dry season from mid-June through the end of October. 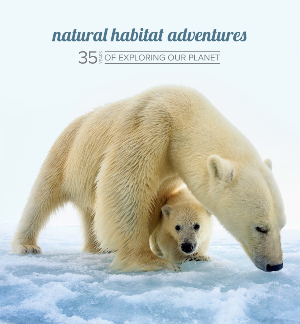 The elephants spend time in the park in pursuit of permanent sources of fresh water, finding lingering waterholes and scratching the ground to uncover hidden springs. 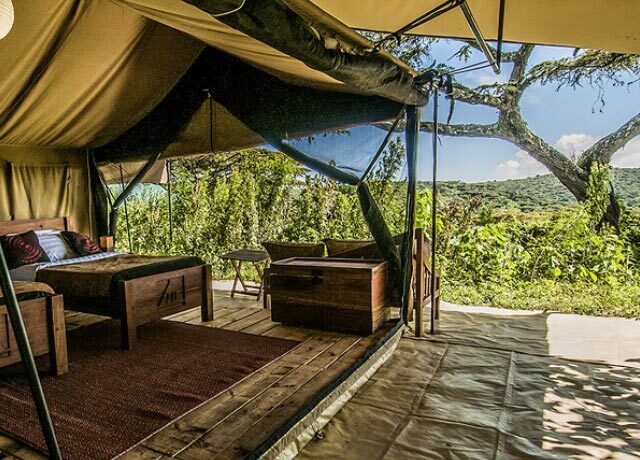 Ndovu Camp features eight walk-in canvas tents, each shaded by a separate canvas covering that extends over a veranda sitting area at the front of each tent. 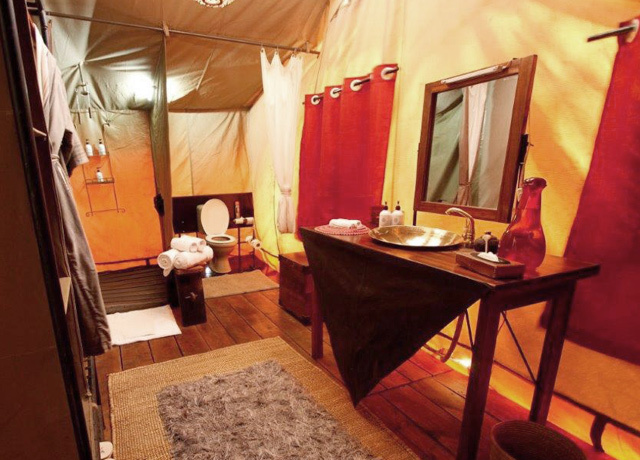 While the camp is mobile, you'd never know it from the deluxe furnishings, which include king-size beds or twin beds with crisp cotton sheets and duvets, bedside tables, a desk, storage trunk, and wardrobe with bathrobes and slippers in each tent; wicker settee and chairs in the common lounge; and a dining table and campaign chairs for fine meals served under canvas. 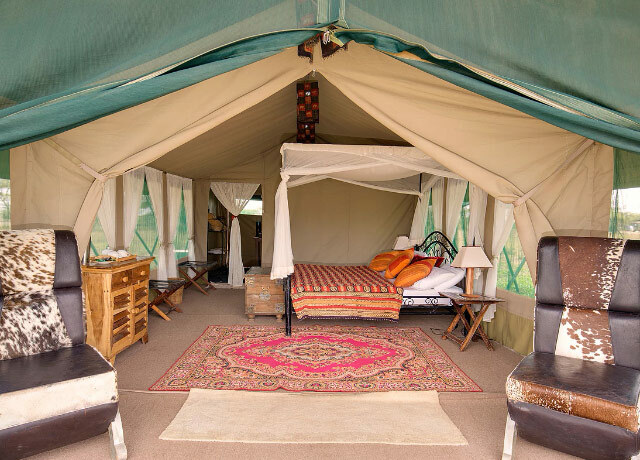 Each tent has private en suite facilities accessed via a separate doorway. 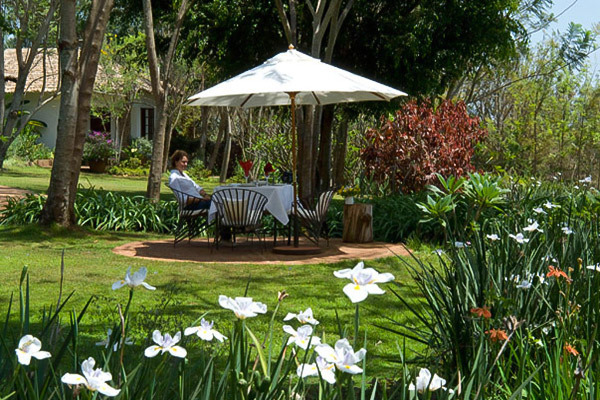 Bathrooms have hot- and cold-water showers, ceramic wash basins and ceramic flush toilets. 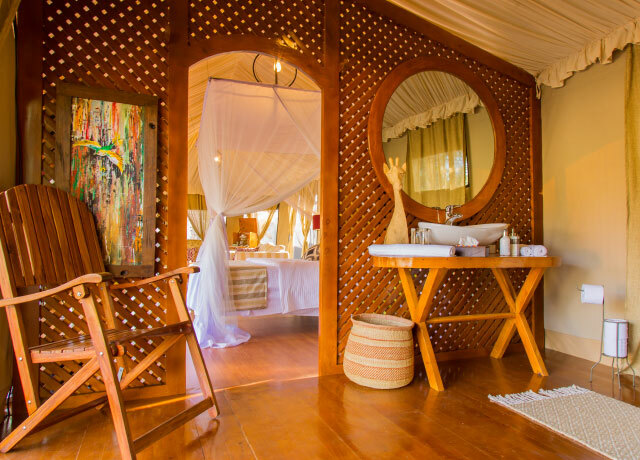 From the entrance of the bedroom and on to the bathroom, each tent is fitted with an extensive solar lighting system. 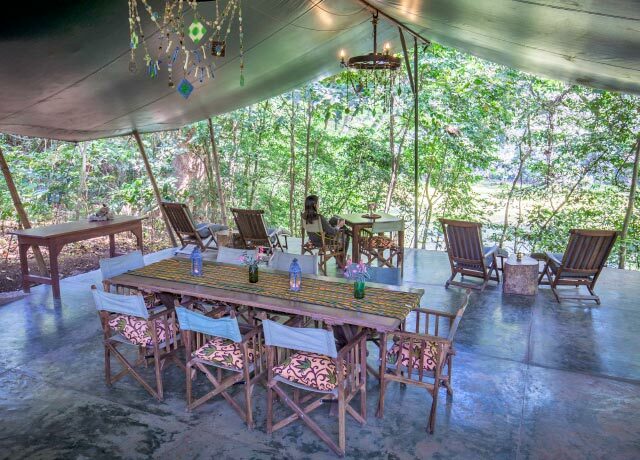 A pathway of atmospheric kerosene lanterns also lights the way between individual tents and the dining tent. 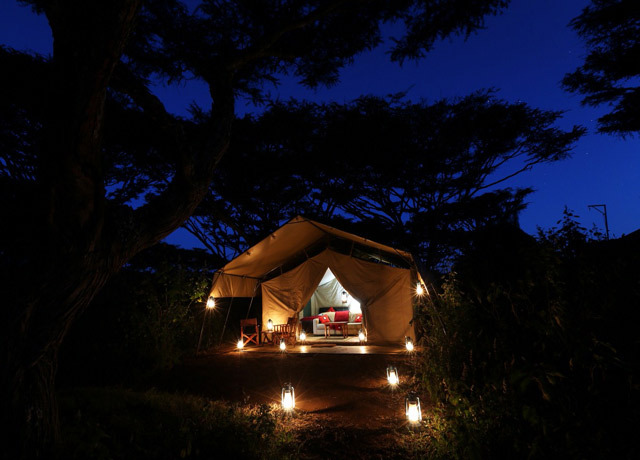 Additional solar guide lights and scented beeswax candles create an enchanting setting in which to unwind after the day's adventures, not to mention a nightly campfire for added ambience. 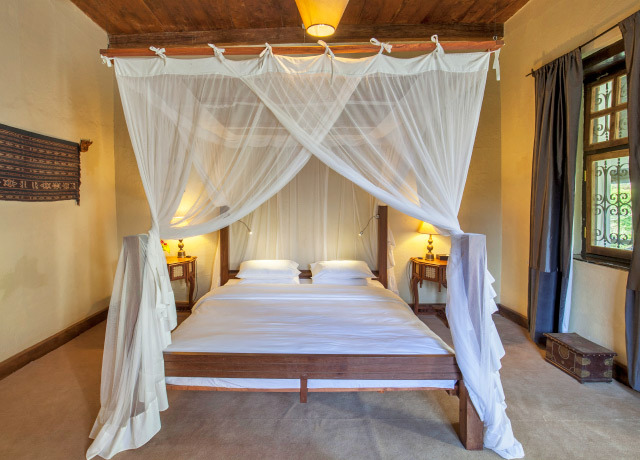 Lemala Ngorongoro is a luxury seasonal camp located in a private reserve on the north side of the Ngorongoro Crater. 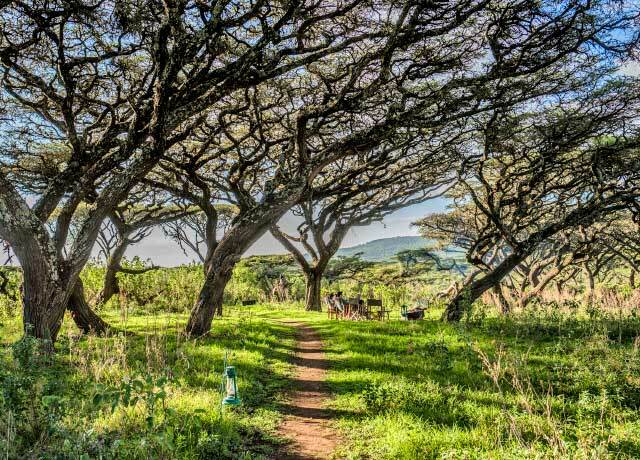 Its optimal location near the less-traveled Lemala access road provides quick and easy entry into the crater, a mere 15-minute descent that maximizes wildlife-viewing opportunities by allowing for full days on the crater floor. 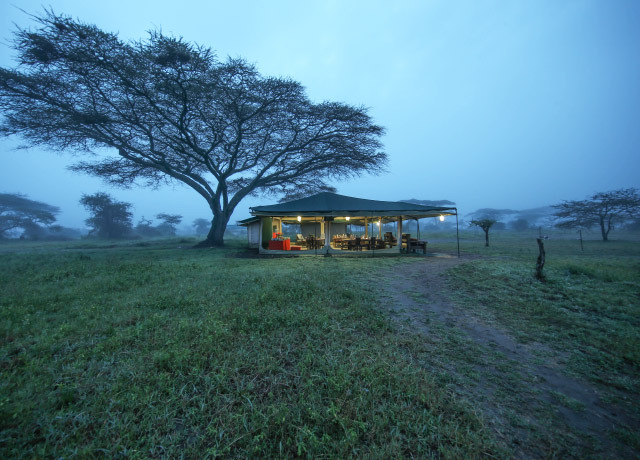 Often, the first hours of a morning safari drive are enjoyed in solitude before others arrive. 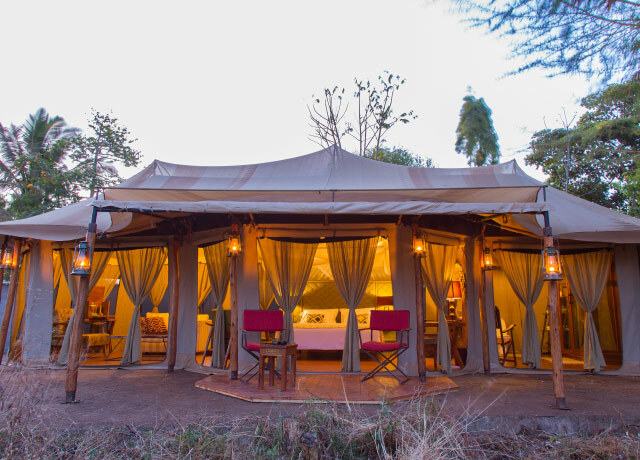 Set in an acacia forest on the crater rim, the intimate camp offers secluded accommodations under canvas in deluxe tents. 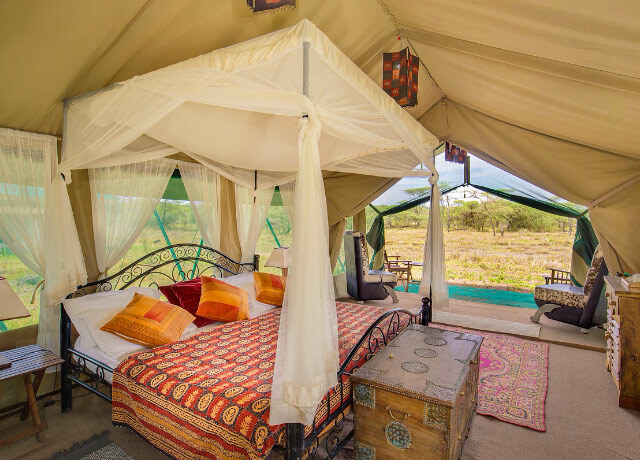 Each of the nine spacious tents is outfitted with a gas heater, large single or king-size beds with warm duvets, wooden flooring with rugs, 24-hour solar lighting, and en suite bathrooms with a dressing area, flush toilet and safari-style bucket shower. 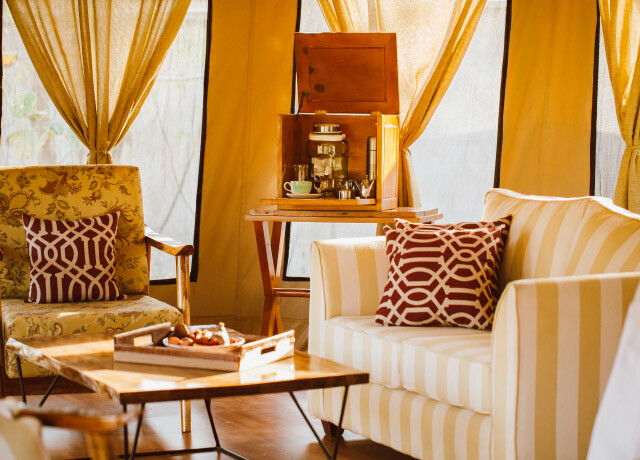 The mess tent is lavishly furnished with grand sofas, lamps, chests, rugs, and book cases and corner cabinets in old wood. 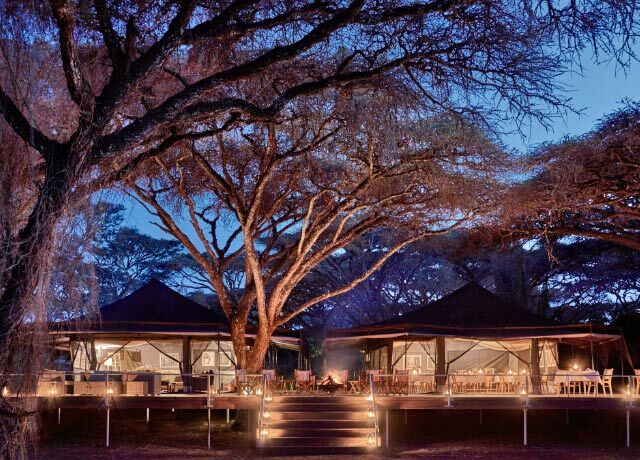 In the evening, guests gather around the campfire for sundowners before enjoying a sumptuous dinner. 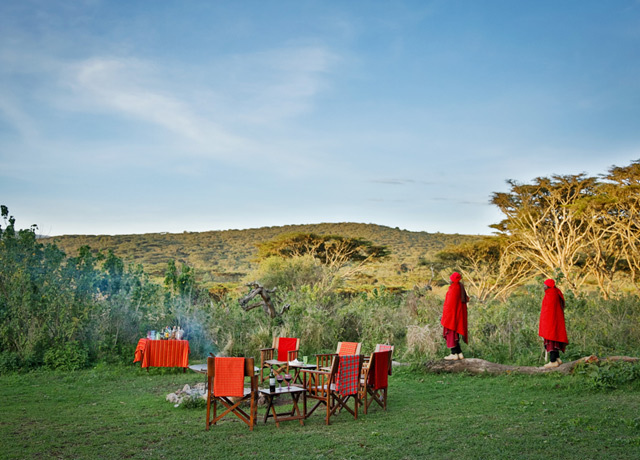 The camp works closely with the local Maasai community, members of which often offer dances and talks on Maasai culture, traditions and ceremonies, an engaging way for guests to learn more about their traditional lifestyles. 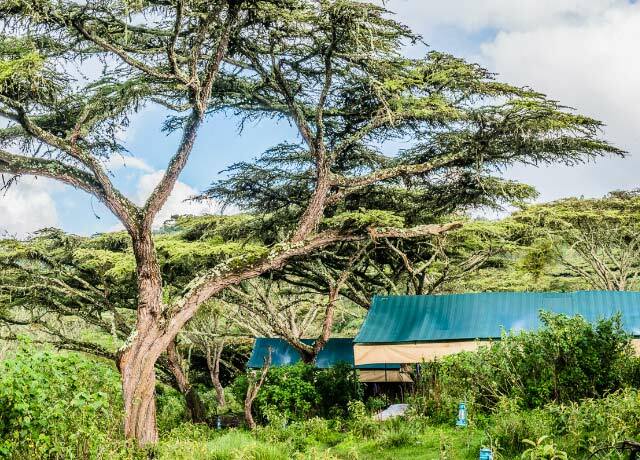 Ang’ata Ngorongoro Camp is perched on the northeastern rim of the Ngorongoro Crater, just a 10-minute drive from the crater floor that's home to some 25,000 animals—Africa's densest concentration of wildlife. 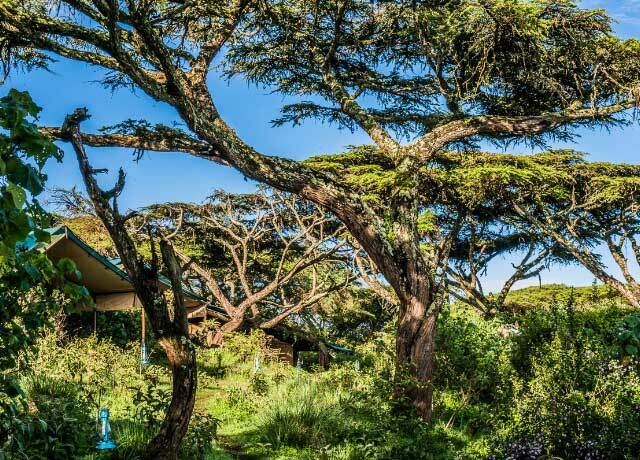 The secluded camp rests in the shade of an acacia forest just inside the park boundary, providing exceptional proximity to the safari wonders on the crater floor. 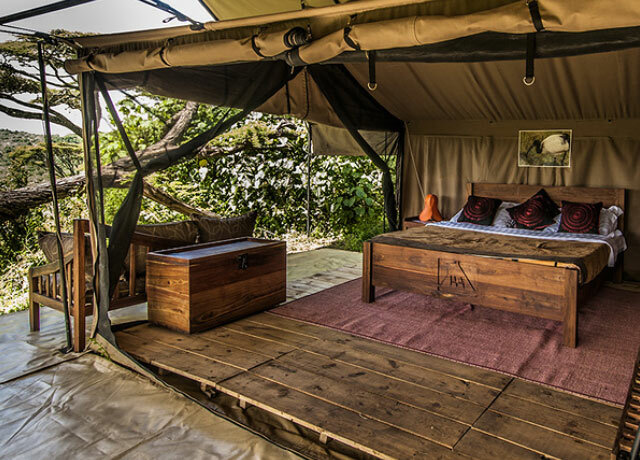 The small, simple camp, with just eight raised canvas tents, exudes rustic elegance. 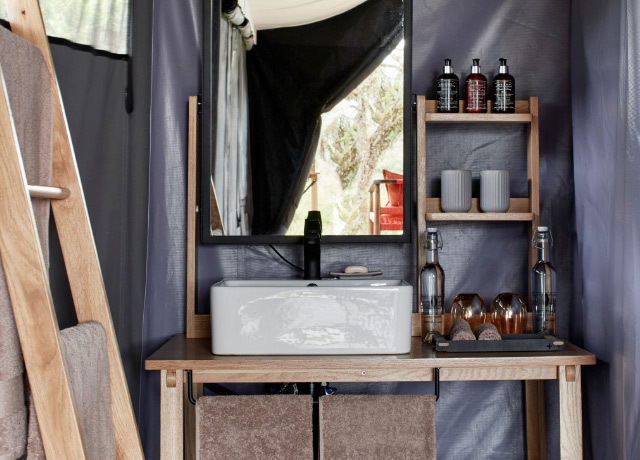 Each classic tent includes an en suite bathroom with shower and flush toilet, plus a vanity. 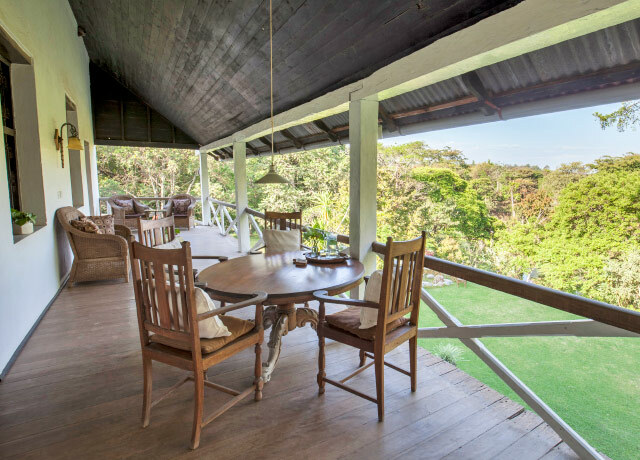 Rustic wooden furniture includes beds — a king or two twins — and lounging couches with large cushions. 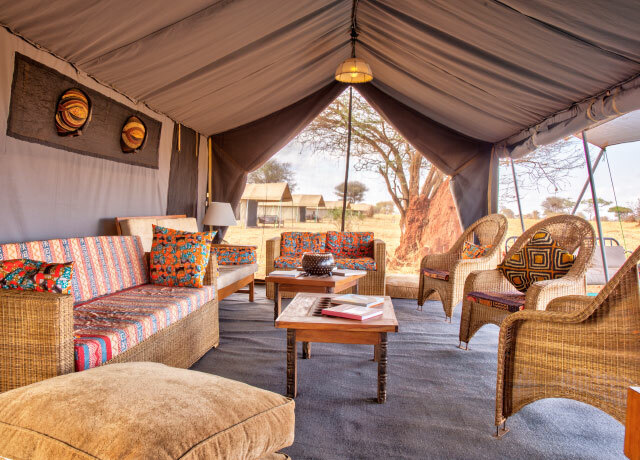 Socialize in the lounge over Tanzanian coffee and tea, or around the campfire pit to share stories under the stars. 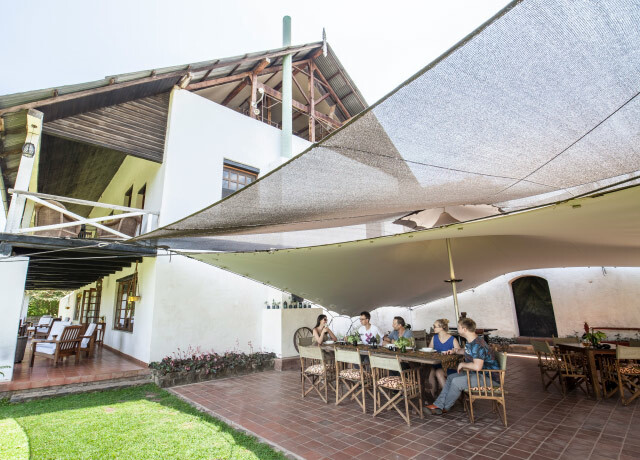 The dining tent offers expansive views over the green hills beyond. 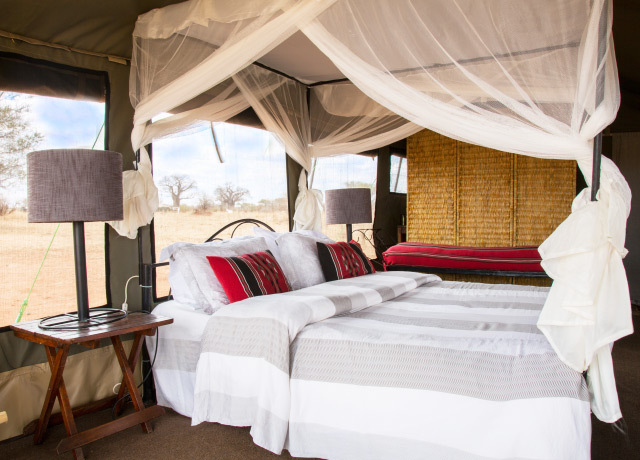 This optimally located camp offers everything you need to feel comfortable in the African bush, promising a restful night’s sleep on the very rim of the crater. 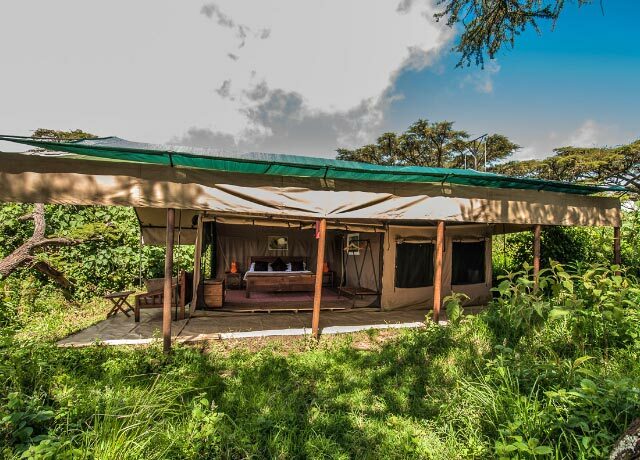 Sanctuary Ngorongoro Crater Camp enjoys an optimal location on the crater rim within the Ngorongoro Conservation Area. 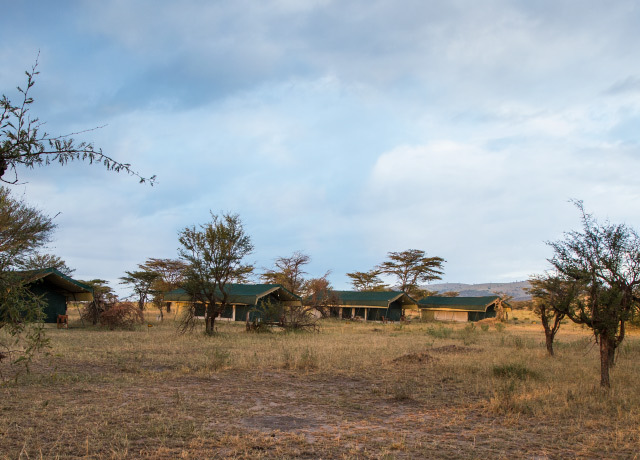 With close proximity to the crater access road, camp guests have unrivaled opportunity for quick and easy entry to the crater, perfect for arriving early in the morning for a quieter safari ahead of the crowds. 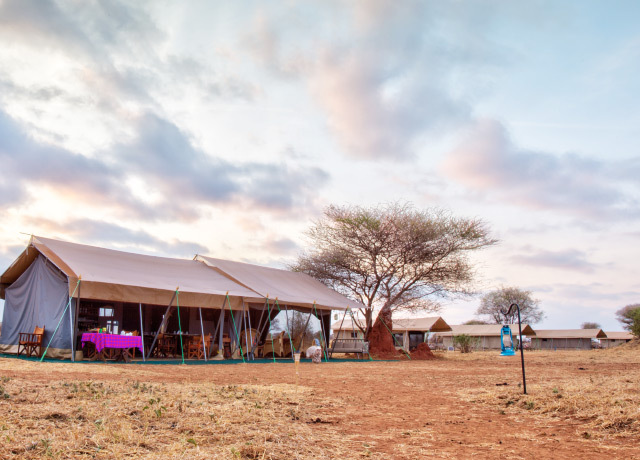 The classic camp is comprised of 10 canvas tents, each with its own en suite bathroom and indoor bucket shower, with a personal tent attendant on hand to fill your bucket shower to the perfect temperature whenever you wish. 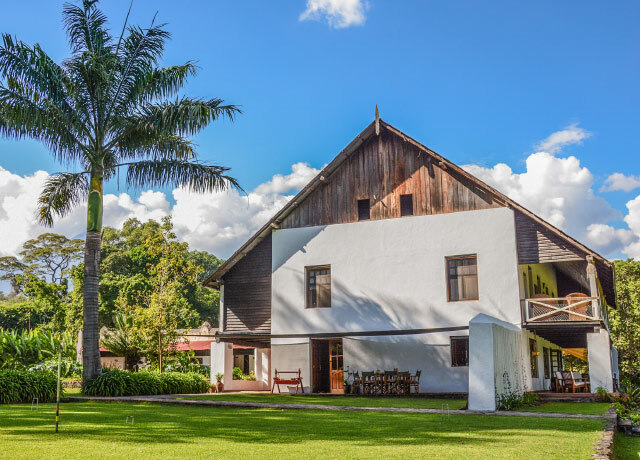 Hair dryers are provided. 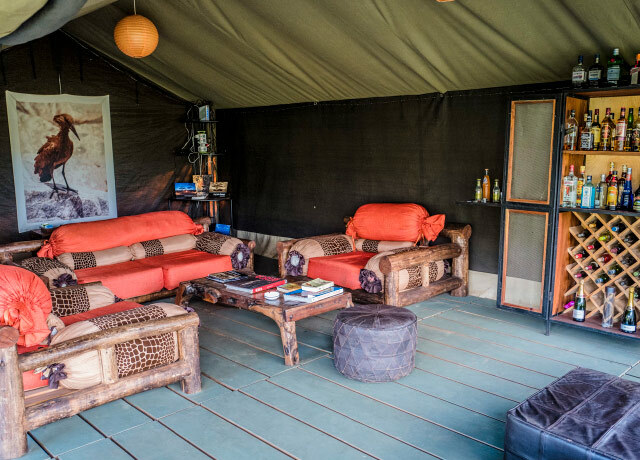 Furnishings include wooden beds and campaign chairs, and a small sitting area in front of each tent offers a quiet spot for guests to enjoy early-morning coffee and biscuits before a day of outstanding game viewing. 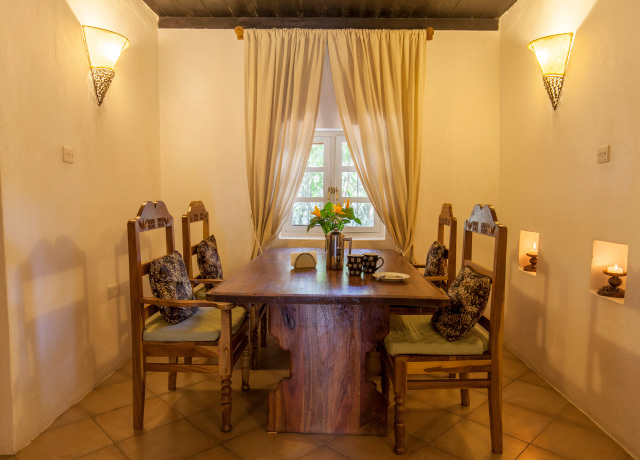 The main common areas include a dining area, bar and lounge with comfortable leather sofas. 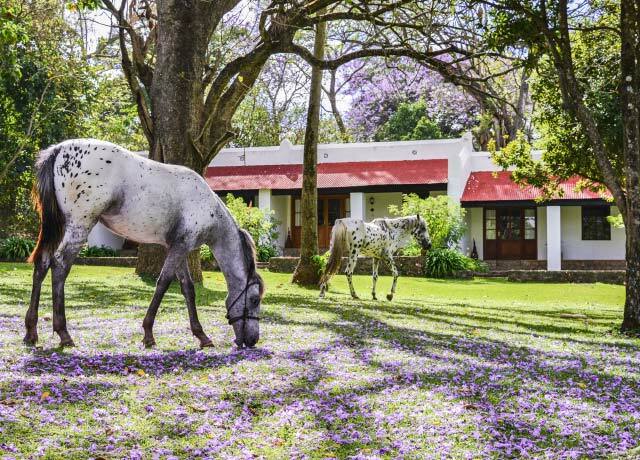 The crater is home to a large assortment of animals including zebra, rhino, buffalo, warthog, wildebeest, hippo and elephant, and an amazing population of predators—lion, hyena, jackal, cheetah and the elusive leopard. 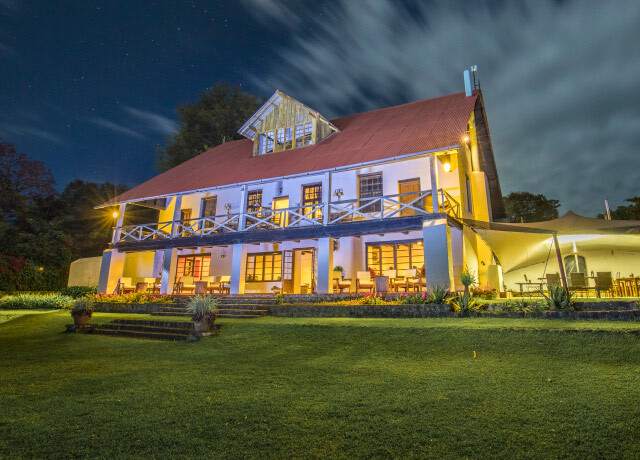 A green oasis amid the red-brown hills of the Ngorongoro Highlands, Plantation Lodge lies at the center of a working coffee, flower and cattle plantation, surrounded by rolling green farmland and lowland forest. 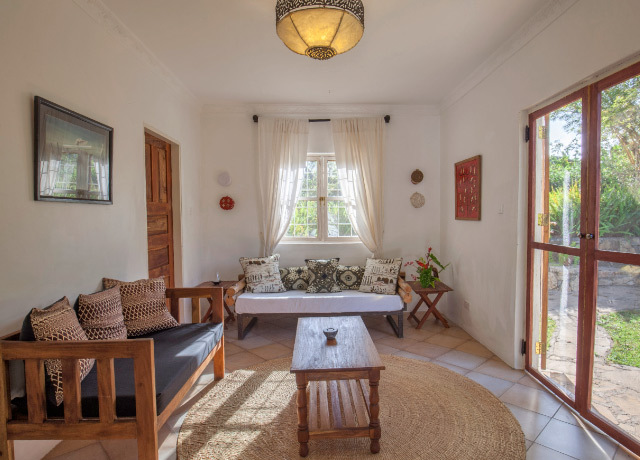 Its 17 individual bungalows provide superb comfort and amenities, each with a separate sitting area, wood-burning fireplace and private veranda overlooking lavish gardens and manicured lawns. 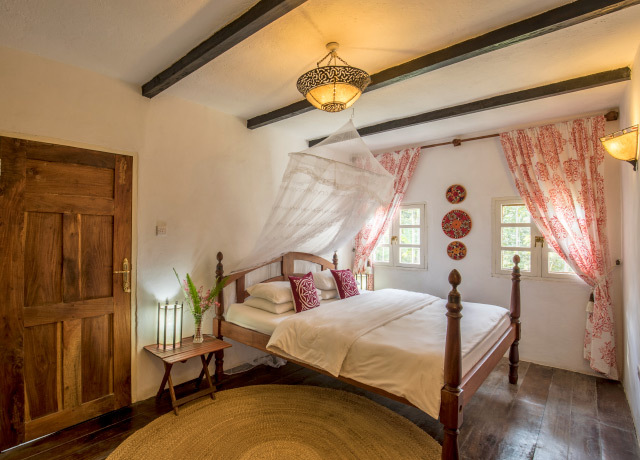 The individually furnished rooms and suites are uniquely decorated with the owners’ fabulous collection of safari antiques and Tanzanian arts and crafts. 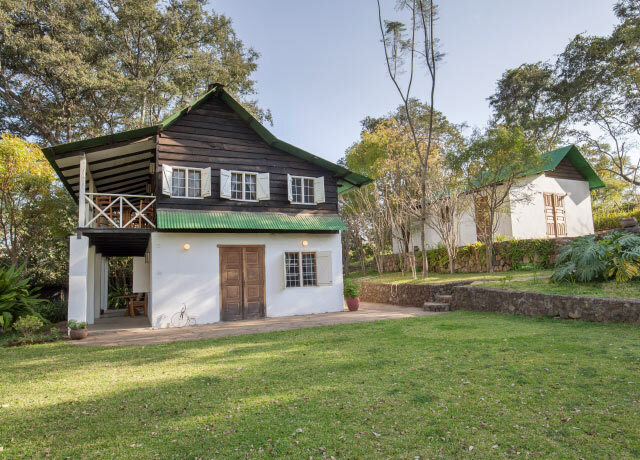 The small size of this owner-run lodge, combined with its colonial-style charm, creates an intimate atmosphere where personal attention and a concern for detail are evident at every turn. 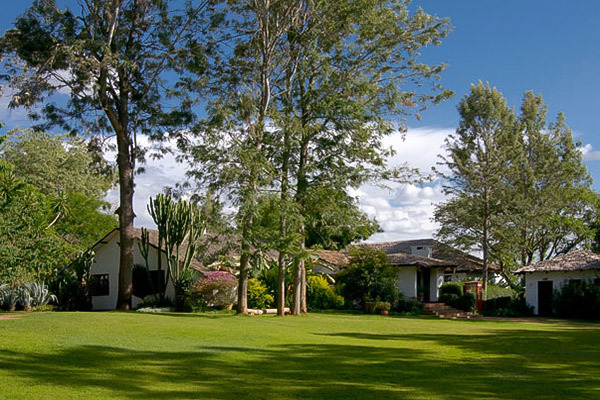 The lodge enjoys a prime location for safari access: it's very near the entrance of the Ngorongoro Conservation Area, a quick hop from Tarangire and Lake Manyara national parks, and a relatively short drive from the Serengeti.